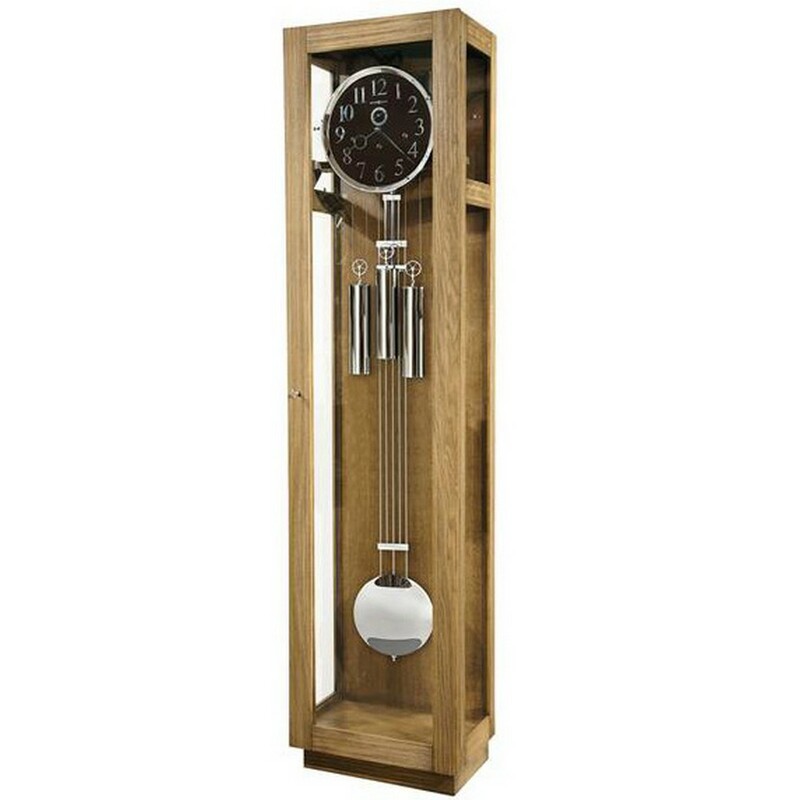 Elegance is redefined with this Howard Miller Moss Ridge Mechanical Floor Clock from Clockshops. Designed beautifully, this clock features a rustic Driftwood finish on select hardwoods and veneers for a weathered and distressed appearance. Soft black dial with raised chrome Arabic numerals, minute track and hands. Polished chrome finished bezel and polished chrome weight shells complement the dial. The polished chrome, grid pendulum adds to the linear appeal of the clock. Soft black dial with raised chrome-finished Arabic numerals, minute track, and hands. A polished chrome finished bezel and polished chrome weight shells complement the dial. Four adjustable Grandfather levelers provide stability on uneven and carpeted surfaces. 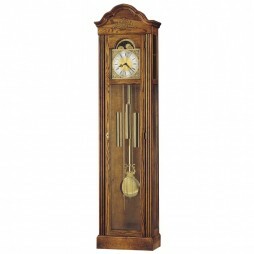 Few household items are more evocative of the sophistication and charming style of the Victorian era, than grandfather clocks. And thanks to the Ridgeway Zeeland Traditional Grandfather Clock, you too can welcome their delight right into your home. 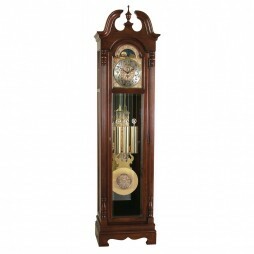 Its embossed face with Arabic numerals, functioning moon dial, gleaming weight shells and ornate lyre shaped pendulum will ensure it will stand out in any room in which it is placed. and Glen Arbor finish. It has further been decorated with reeded columns with upper and lower turned caps and beveled glass on its front and side glass panels. 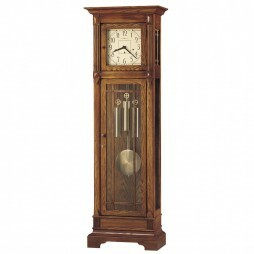 Let your living room look fabulous and alluring with this Howard Miller Cherish Curio Floor Clock. 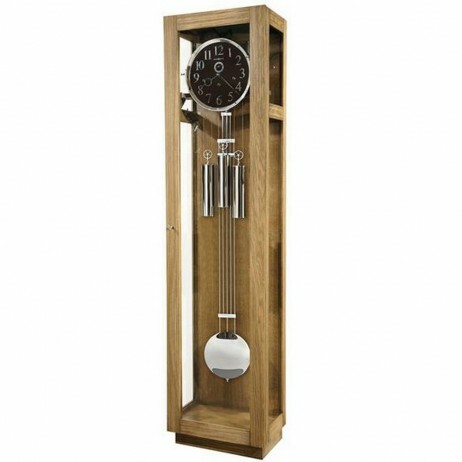 It is a tall, but smaller footprint curio floor clock that will display your collectables in fashion. 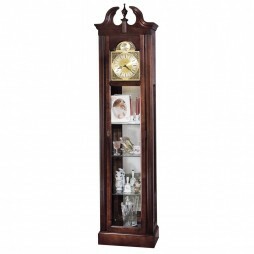 This curio grandfather clock is lightly distressed and features a graceful swan neck pediment with turned finial. Tempus Fugit (meaning “time flies”) dial features silver chapter ring and decorated corner spandrels. Made of durable material, this chic clock can be gifted to your loved ones.